Once viewed as the idle pursuit of low races, the development of clockwork and steam power has since swept across the lands of the North like a wildfire. High Thonians now boast the bravest and most innovative advances in these arts, and the call for the fruits of their labours grows louder with each passing day. But every new order threatens the old, and resistance to the march of progress grows, as well. What stand will you take in the name of science? 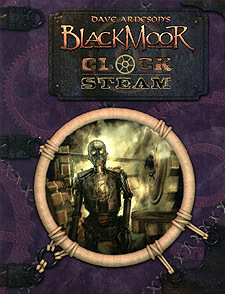 Welcome to Clock and Steam, the comprehensive guide to "gadgetech" for Dave Arneson's Blackmoor. This long-awaited sourcebook reveals the ways in which clockwork and steam-powered devices have shaped the lands of Blackmoor, and adds new dimensions of play to any fantasy campaign. Now players can step into the role of creator, with a new base class - the inventor - and prestige classes such as the clock mage, the infuser, and the warmaker! Requires use of the Dungeons & Dragons Player's Handbook. This product uses material from the v.3.5 revision.